The macula is the central part of the retina, and is responsible for detailed vision, such as r reading, seeing faces, and watching TV etc. Myopia is an optical condition caused by having an extra-long eyeball, so the eye may be 28 mm long instead of the normal 22.3mm, for example. Because the eyeball is extra long the retina becomes very thin and may become damaged. 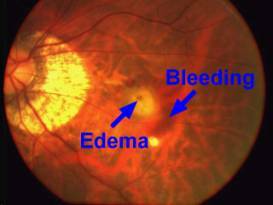 If the macula is damaged (the central area of the retina), central vision will be affected. There may be distortion with bendy lines, or there may be a patch in the centre with no vision. In myopia the eye is extra long, and the retina extra thin. This may lead to damage to the central area of the retina (the macula). The main type of macula change in myopia is thinning of the retina in the macula area. This is not treatable, and gets worse very slowly with age. Central vision is affected, and reading, TV, crossing roads, seeing bus numbers, become difficult Everyone keeps their side vision, and no one becomes completely blind. Generally the worst outcome is partial sight. .Low visual aids and help from the low vision team can be very helpful indeed. In this type of myopic macula disease, new vessels grow in the macula area. 5% of highly myopic eyes (more than -6.00d) develop CNV. This is similar to wet ARMD, but in myopia it may occur in much younger people. However, it is much commoner in older people with myopia. These new vessels are called 'CNV'...choroidal new vessels or choroidal neoovascularisation, as the blood vessels originate in the choroid and grow under the retina. 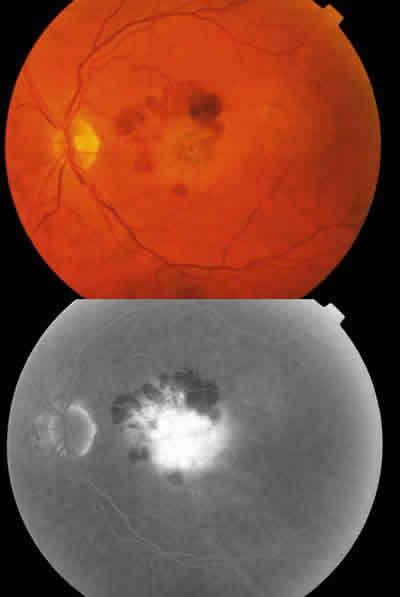 The CNV cause retinal leakage and swelling. The condition progresses to cause a scar in the macular area. If the scar is small, sight is reasonable; if large, the sight can be very poor. 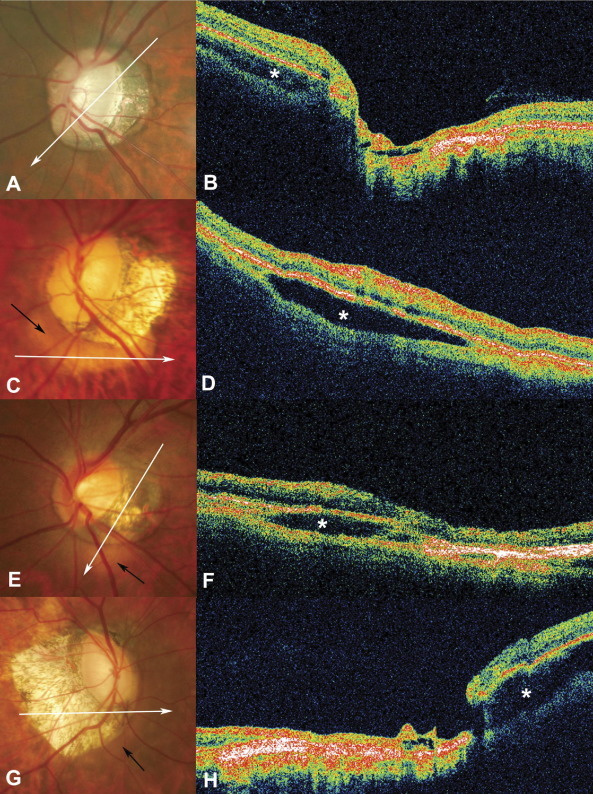 Myopic CNV respond well to anti-VEGF treatment, needing less treatment that pure ARMD. The long term prognosis is getting better. Younger patients have a better prognosis..the CNV get walled off. Some CNV are related to newly developed areas of lacquer cracks Eye 2011. Retina 17 " Dome-shaped macula is a condition associated with myopic eyes that seems to remain stable over time in terms of vision and macular profiles. It is often associated with chronic SRF, for which no effective treatment is current available. However, SRF does not seem to be a significant cause of visual impairment."